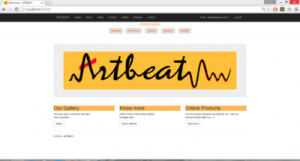 This application named Artbeat, this is online shopping website which displays art products. Website Contains shopping cart and category wise gallery. It also provides admin login with the add product and delete product compatibility. Provides user login and password management. Admin reports are not included in this version. Please download the source code and try then develop it for your necessary. This application is using Asp.Net with c#, Sql database, Bootstrap3.